Andrew is a first-generation American born with a Peruvian heritage. After living in Europe for several years, Andrew thought it was time to move to his home country of Peru, a place he had felt that he never really understood. 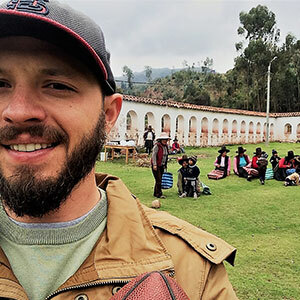 After calling Peru home for the previous 4+ years, Andrew realized that there was a new, bigger piece of the puzzle to take on…how to make a sustainable impact to those who are in most need? With a B.S. in International Business Administration, and years of working in a variety of industries within the business world, Andrew has finally decided to take a leap of faith and be a part of something that has meaning and that provides a personal challenge to him – social innovation. Ready to look for new opportunities and for a purpose in life that allows him to make real and direct contributions to social challenges that affect our world today, he couldn’t feel better about the guidance and preparation that awaits him with Amani. Andrew is a strong believer that revolutionizing how we approach education is the key to transforming some of the alarming realities of today’s world.